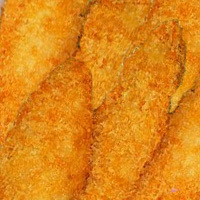 Frozen Fried Fish. Fried fish is a processed fried food that commonly uses ready to fry frozen fish battered in bread crumbs. It may contain cod and other assortment of fish. It is relatively high in calories due to the fact that it is a fried food. Similar to squid rings it is said to go well with donburi bowls serving as an excellent side dish. The calories in Fried Fish per 40g(1item) is 59 calories. Fried Fish is calculated to be 148Cal per 100 grams making 80Cal equivalent to 54.05g with 7.72g of mostly carbohydrates、4.64g of protein、1.08g of fat in 40g while being rich in vitamins and minerals such as Niacin and Sodium.